While two-lane country roads oftentimes get romanticized, the backbone of this country’s highway system sometimes gets called sterile, boring and unadventurous. However, people who make such claims miss the larger point. While for a short drive, a state route may be more interesting, 1200 miles of nothing but small towns gets old, fast. Around the turn of the 20th century, the supply of good roads in America came nowhere near meeting the growing demand. Most “roads” at that time were little more than improved wagon trails. Indeed, many of the major “highways” back then were actually vestiges of old pioneer trails, including the Oregon and Santa Fe Trails. There were, to be sure, some “paved” highways, but most were cobblestone and almost all were located in and around major cities. Before the interstate highway system brought fast, limited-access highways to America, there was, and remains to this day, another nationwide system of highways that enabled travelers to follow standardized routes to most parts of the nation. This system, known as the United States Highway System, or simply as “US” highways, marked the first time in American history that a national standard of sorts was set for roads and highways. Created by the Federal Aid Highway Act of 1925, this system was established in response to the confusion created by the 250 or so named highways that then existed, such as the Lincoln Highway and the National Old Trails Road. Instead of using names and colored bands on telephone poles, this new system used uniform numbers for “inter-state” highways and a standardized shield that was intended to be universally recognizable. Planning for what is officially known as the Dwight D. Eisenhower National System of Interstate and Defense Highways, commonly called the “The Interstate System,” began in the late 1930s. The Federal-Aid Highway Act of 1938 called on the then Bureau of Public Roads to study the feasibility of creating a toll-financed system of three east-west and three north-south superhighways. The Federal-Aid Highway Act of 1944 called for designation of a National System of Interstate Highways, so located as to connect by “paved routes the principal metropolitan areas, cities, and industrial centers, to serve the National Defense.” Neither the 1944 act nor subsequent legislation in the 1940s authorized funds specifically for an Interstate System. Under the leadership of President Eisenhower, the question of how to fund an Interstate Highway System was resolved with enactment of the Federal-Aid Highway Act of 1956, which Act called for significant Congressional funding and served as a catalyst for the system’s development and, ultimately, its completion. The 1956 Highway Act was championed mightily by Eisenhower, who was influenced both by his experiences as a young solder trying to cross the country in 1919 following the route of the Lincoln Highway, and by his appreciation of the German autobahn network, which Eisenhower personally witnessed as Supreme Allied Commander during World War II. The Eisenhower System of Interstate Highways is dated from June 29, 1956the day President Eisenhower signed the Federal-Aid Highway Act. On August 2, 1956, Missouri became the first state to award a contract with the just-established interstate construction fund. The Missouri State Highway Commission worked on three contracts that day, but the very first signed contract was for work on U. S. Route 66  now Interstate 44  in LaClede County. As soon as that contract was signed, S. W. O’Bier, district engineer for the U. S. Bureau of Roads, called his headquarters in Washington, D. C. to confirm that the Missouri contract was indeed the first in the nation. That’s one first, but Missouri claims another. Also on August 2, 1956, Missouri awarded a contract for work to be done on U. S. 40  now I-70, the Mark Twain Expressway  in St. Charles County. On August 13, this became the first interstate project to be awarded following signing of the 1956 Act. 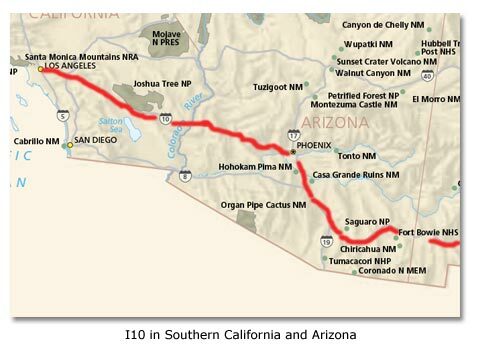 Transcontinental Interstate 10 serves the southern tier of the United States by providing the main east-west link from San Monica and Greater Los Angeles in the west to Jacksonville in the east. It is one of three coast-to-coast interstates (the others being Interstates 80 and 90). In California, Interstate 10 leaves the greater Los Angeles metropolis some 70 miles east of downtown Los Angeles. It enters the desert just beyond the narrow San Gorgonio Pass, west of Palm Springs. From there, the freeway becomes characteristic of a rural desert, one it will retain through much of its journey through the American Southwest. West to East, I-10 is 2460 miles long. 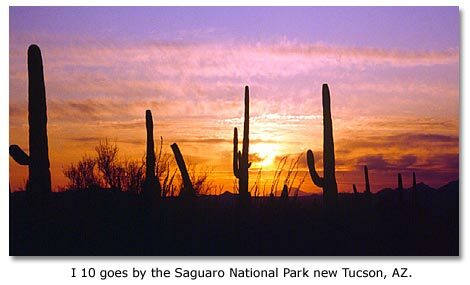 Some 237 of those miles are in California, 392 are in Arizona, 160 in New Mexico and 879 in Texas. El Paso, Texas is 785 miles from the western terminus of Interstate 10, making it closer to Los Angeles than it is to Orange, Texas, 880 miles away, near the Louisiana border. Dust storms are common along I-10 from Phoenix to El Paso, and can be hazardous. Much of I-10 replaced former U. S. 80, which today ends in Dallas, Texas. 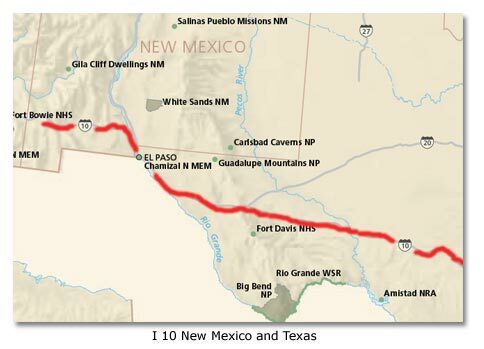 Prior to the building of Interstate 10, U. S. 80 was, along with “the Mother Road” (Route 66) the major transcontinental route. The Interstate Highway System was officially completed in 1991. The initial cost estimate was $25 billion over 12 years; it ended up costing $114 billion, taking 35 years to complete. In addition to being designed to support automobile and heavy truck traffic, interstate highways are also intended to support military and civil defense operations within the United States, particularly involving troop movements. One potential civil defense use of the Interstate Highway System is for the emergency evacuation of cities in the event of a nuclear war. The system has been used to facilitate evacuations in the face of hurricanes and other natural disasters. An option for maximizing speedy evacuation is to reverse the flow of traffic on one side so that all lanes become outbound thoroughfares. This procedure, known as “contraflow” was witnessed in 2005 in the Interstate 10 evacuations of Houston (successful) and New Orleans (unsuccessful) prior to the respective arrivals of Hurricanes Rita and Katrina. Prominent interstates in the West that motorists are fond of driving along include 40, 17, 10, 8, and 19 in Arizona, 80 and 15 in Nevada, and 10, 8, 15, 40, 5, and 80 in California. All but five state capitals are directly served by the Interstate Highway System. Those not served include Juneau, Alaska, Dover, Delaware, Jefferson City, Missouri, Carson City, Nevada and Pierre, South Dakota. Many Americans take these magnificent ribbons of concrete and occasional asphalt for granted; yet for those of us who grew up in the middle part of the 20th century and who can actually remember Dwight Eisenhower, the five-star general and President, they are an indelible part of the landscape that has, for better or worse, helped define the American experience. 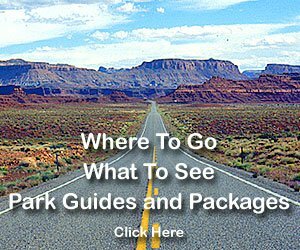 Click Here for a PDF for a map of the US showing all the National Parks and the interstate roads.